we wanted to give you a sneak peek to a guest post that will be up in april on behind the bar, a design sponge monthly cocktail feature. we were lucky enough to share our gin & ginger a while back, and were thrilled to be asked to do another. 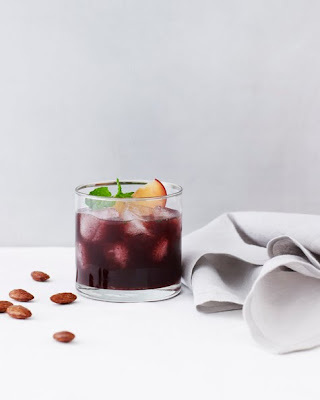 we're really on a whiskey kick right now, and created a drink that we hope everyone can enjoy...we'll share the link to the recipe for our blackberry smash as soon as it's up! in the meantime, these simple cocktail nuts are perfect to go with almost any cocktail - cheers. toss all ingredients in a bowl and mix together. spread on a sheet pan and place in a 350 degree F oven for 10 to 12 minutes. let cool completely and enjoy! what a gorgeous colored cocktail! Looking foward to hearing the exact ingredients for this gorgeous cocktail....in the meantime sweet, spicy nuts will definitely keep me going. love the idea of maple with chipotle, and blackberries are one of my faves ... can't wait to see the recipe!